Kurt Busch started sixth and finished third, scoring eight bonus points. The No. 41 Haas Automation/Monster Energy Ford Fusion was a bit loose early on, but Busch worked his way up to third. Busch passed Martin Truex Jr. for second on lap 60. Teammate Aric Almirola passed him for second with eight laps left in the stage. Busch started second and finished fourth, scoring seven bonus points. The No. 41 Haas Automation/Monster Energy Ford Fusion pitted on lap 105 for four tires, fuel and a tire pressure adjustment. Busch took the lead at the start of Stage 2. On lap 169, teammate Clint Bowyer passed Busch for the lead. Busch said his car was good after 15 laps, then worse after 60 laps. The No. 41 Haas Automation/Monster Energy Ford Fusion pitted on lap 205 for four tires, fuel and a wedge adjustment. Busch took the lead at the start of the final stage. On lap 251, Bowyer again passed Busch for the lead. During a pit stop on lap 273, as the car of Daniel Suarez was leaving the pit box behind Busch’s car, Suarez’s car hit the air hose, ripping the air gun out of the hand of Busch’s rear-tire changer. That slowed the stop, and Busch fell from fifth to ninth. Busch pitted on laps 329, 370 and 391 for four tires, fuel and a wedge adjustment. The track bar in the car broke at the 300-lap mark, which hurt the car’s performance in the last laps of the race. Busch finished third in Stage 1 to earn eight bonus points and fourth in Stage 2 to earn an additional seven bonus points. 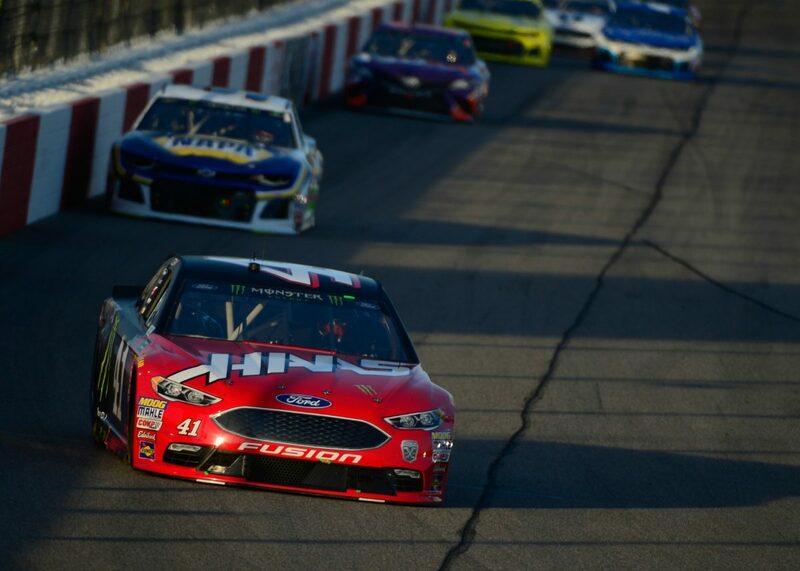 He led twice for 98 laps to increase his lap-led total at Richmond to 904. He also surpassed 9,000 total laps led in the Monster Energy NASCAR Cup Series, becoming the 21stdriver to lead more than 9,000 laps. Kyle Busch won the Richmond 400 to score his 46thcareer Cup Series victory, his third of the season and his fifth at Richmond. His margin of victory over second-place Chase Elliott was .511of a second. Twenty-three of the 39 drivers in the Richmond finished on the lead lap.